In honor of Earth Day on Monday, April 22 the Post-Gazette will be delivered digitally only. There will not be a printed Post-Gazette that day. E-delivery is available at pge.post-gazette.com. 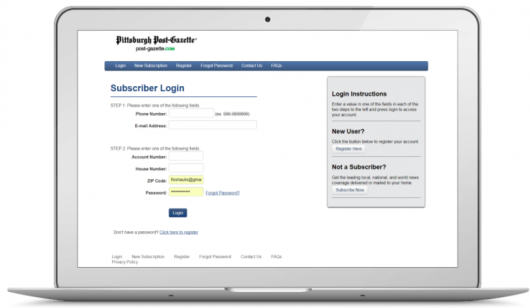 Welcome to online management for your Pittsburgh Post-Gazette print newspaper or digital access account. The online account management service provides you with various options. Need assistance? Contact our Support Center at pgforme@post-gazette.com or 1-855-PGFORME (743-6763). Click here to view the subscription policies, terms and FAQs.